I used to haunt Tekka Market almost every weekend when I lived closer to the city. Every Sunday, I would awaken extra early to go the the wet market and do all my groceries before all the Bangladeshi workers invaded Little India. I've really miss it since I moved away and have not visited it in ages. But with the new train station situated just behind Tekka Market, it is much more convenient now. So I decided to pay this stupendous landmark a visit this morning, especially after reading Chubby Hubby's post about his favourite stalls. I am an equal opportunity shopper whose choices depends on what I needed, who had had the freshest and another highly scientific criteria. I choose to buy from people who can actually understand me, which means usually the English-speaking ones. This visit was not just a nostalgic walk down memory lane. I have been craving beef and the fact that you just cannot find a butcher that sells beef in my vicinity meant I had to go further afield. Tekka Market was it as I also wanted to buy duck eggs and get some spices from Little India. The thought of the inevitable hordes of people patronising Tekka Market for their Chinese New Year shopping prompted me to be at there before 9am. The mission: Focus on targets. Acquire targets. Evacuate post haste. At least that was the plan. I reckoned without my usual gluttony. All was well until I decided to make my way home. I passed by a stall with four people queued up in front of it. Normally, this is not an unusual sight. But at 9.45am in the morning? Who queues up at that time for food? What food can be that enticing? Curiousity led me to the stall. All the sign said was "Prawn Noodles". That's it. A weathered old man was behind the glass shelves in the ubiquitious hawker uniform of white singlet and blue shorts. I watched him potter around like the Eveready bunny. He hardly looked up from his work as his deft fingers distributed fish cakes, peeled prawns, blanch noodles, plated food and collected money. Despite how fast he worked, it was apparent that it was slow going. He had hardly any mise en place which necessitated his constant stopping midway to peel prawns or to slice pork while cooking the food. But the four people were very patient and nary a peep was heard as they awaited their food. Now that is unusual. Singaporeans love complaining. The fact that no one was raising a stink about the slow service could only mean one thing. The food must be helluva good. I joined the queue. It took 20 minutes before I got my prawn noodles. But the people in front of me who had been waiting even longer were very very respectful. But not so the two miscreants who later joined the queue behind me. The two Chinese men waited for 5 minutes before making loud comments about the old man's inefficient way of working. After hearing them on about how he should have prepared earlier and how long he was taking, I was tempted to chastise these two ill-mannered oafs when the lady in front of me informed them curtly that the old man usually had an assistant who did not show up today. You would think that would have silenced them. Instead, these lower life forms started arguing with her instead. I felt really sorry for the old hawker as he was visibly agitated and upset by this turn of events. Subsequently, another lady and I ended up helping him slice fish cakes and pork in order to get our orders sooner. I was almost reluctant to leave the poor old man alone to the mercies of louts like the two morons behind me but I knew that he would be embarrassed by my help. As it was, his chagrin was fairly obvious when we "self serviced" and helped him slice the fish and pork. I decided a discreet retreat would at least save him further embarrassment. What happened to respect for your elders and family breeding? In my father's restaurant, if you pulled something like that, you'd better not eat anything they served you. My father had some really inventive people working for him. Anyway, I went home but did not eat my prawn noodles till much later. I heated up the broth and dumped the vermicelli and seafood and pork slices into it. The fact that the broth was lushly brown boded well. It was swoon at first sip. Even after a couple of hours and a reheating of the broth, this prawn noodles was still a magnificent dish. 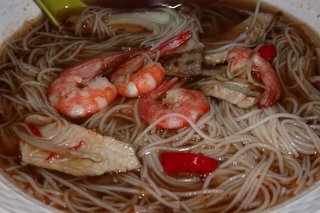 The broth was beautifully fragrant and sweet with the rich taste of the sea. The distinctive melding of prawns and pork bones was definitely the foundation of this prawn noodles. Now I knew why everyone waited close to 30 minutes just for a bowl of this simple but incredibly tasty dish! It was well worth the wait. For the cost of S$2, this prawn noodles had slices of fish cakes, pork and about 4 prawns all embedded like gems in delicate vermicelli swimming in a sea of broth. I am determined to go back again to Stall no. 353 at Tekka Market sometime soon to try this prawn noodles dry as I saw a number of people happily slurping these there. Sometimes being a sheep and blindly following a queue can be a good thing. Poor old man and the disrespectful customers. I'm sure those two will get what is coming to them. Well, even in Singapore it is getting harder to get food here for $2 but there are still some little places that serve excellent nosh at that price. It is one of the things I really like about Singapore.